It’s no secret I love a good stripe. Whether it’s a thick, nautical stripe or a thinner Parisienne look, striped tops are super versatile any time of year. I recently found this cute tie-front top and have worn it a bunch already! It’s just so easy to throw on with jeans and my favorite neutral accessories. This top is versatile for other reasons as well – the sleeves can go long or be shortened into a 3/4 sleeve, and the tie-front look is optional. You can also wear it like a traditional button-down! Endless styling options. If you’ve also got stripes on the brain, here are some other great styles I’ve found: this ruffle-sleeve top gives classic stripes a fresh, feminine update. The relaxed fit of this Tibi top make it an effortless travel essential – pair it with a panama hat and high-waisted skirt a la this look! This slightly off-the-shoulder top will be the perfect Parisienne compliment to your wardrobe. Sometimes simple is the best way to go – this comfy long-sleeve tee or this short-sleeve option are both must-haves. Just got that bag in the mail yesterday so excited to style it. Love your top. Gorgeous — I’m loving how each piece is so classic on its own and styled together! Love this look! I’m obsessed with black and white – as that is about 90% of my wardrobe. Such a classic look! I’m stripe crazy as well – I just picked up the prettiest striped blouse from J.Crew. I love the leopard detail you added to this look, and the contrast of the casual tied top with the pointy heels! love your striped top, thanks for your sharing! 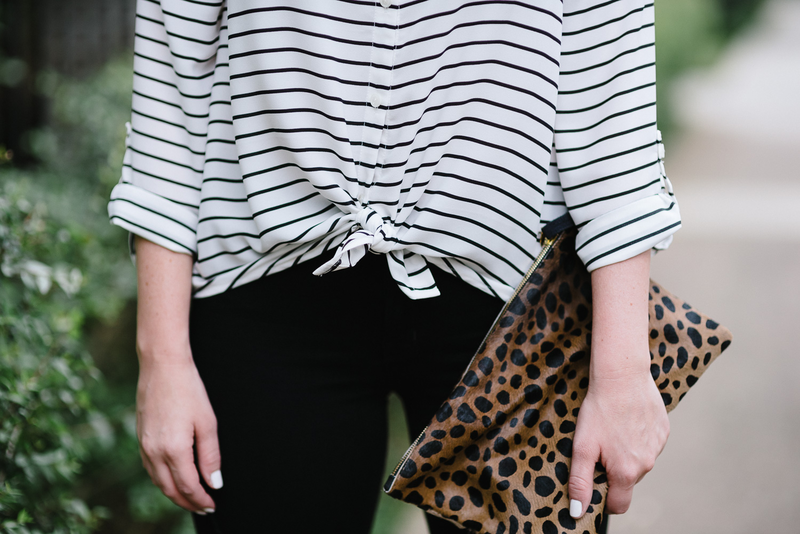 Love the leopard bag playing against the stripes. Love your style and bag SO much. stripes, black skinnys and cheetah. Yes, please! This look is so great together, and also such fabulous versatile basics. My favorite kind of pieces! Nothing better than a stripped tee! Great look with the pumps!